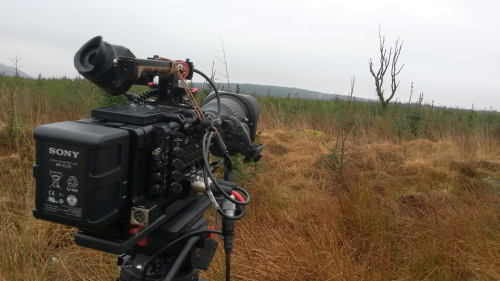 Most people that I meet say ‘Oh you must have a lot of patience to be a wildlife cameraman’. Well, that is true as far as it goes. A case in point is told by the picture here. There was a great grey shrike in the area and it had been seen on the spiky dead tree in this upland forestry clearing. The shrikes are very mobile at this time of the year it could have appeared at any moment as part of its tour around a large hunting area. But it didn’t. It was however seen on this very spot a couple of hours previously, and no doubt turned up again the moment we left… but that’s the nature of the game. The patience part is just standing there in a constant state of anticipation, never thinking that this might not be your day. I hope to report before the winter is out that we did actually film one of the little blighters.